Become one of the most infamous bounty hunters to travel the galaxy with this Jango Fett Collector’s Helmet. The one-piece accessory has a silver and blue shaded shell and is made of vinyl. In addition, the “T” shaped visor has a smoked see-through front lens. Complete your Jango Fett costume with this officially licensed Star Wars helmet. 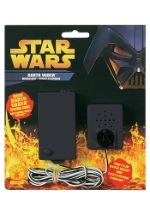 And check our Star Wars accessories for more collectible Star Wars items.